The system requirements of the ‘always on / connected car’ are increasing demands for the bandwidth available for in-vehicle data communications. As a result, engineers are turning to Ethernet. Klaus Neuenhüskes, Manager, Automotive Business Unit, Toshiba Electronics Europe explains. Increasingly, intelligent infotainment systems are making the car an extension of their owner’s digital lifestyle. In fact, infotainment systems are becoming a key differentiator in the eyes of the consumer. At the same time, government mandated safety systems such as reversing cameras are contributing to the need for effective, reliable and fast data communications. And, as the car becomes increasingly data hungry, the demand for effective, reliable and high speed communications is growing. There are several choices of media communications protocols available to the designer - the most well known to date being Media Oriented Systems Transport, or MOST. The MOST bus is a high speed multi-media network technology whose latest incarnation (MOST150) supports data rates up to 150Mbit/s (six times that of the original MOST25) and is capable of providing a physical layer to transmit all forms of data, including video. However, Ethernet is rapidly becoming a popular choice for infotainment systems as the technology is well understood. Currently, Ethernet offers up to 100Mbit/s in automotive applications but a 1Gbit/s standard based on reduced twisted pair (RTPGE) is about to be finalised by the IEEE, while speeds of 10Gbit/s are being discussed. One of the limitations of Ethernet is the management of network contention. Which is why, as Ethernet takes on a wider role within vehicles, a better solution is being developed in the form of deterministic Ethernet. During 2013, there were approximately 3.8 million automotive Ethernet nodes shipped. Japanese analyst Yano Research (Figure 1 - above) predicts 50 million nodes this year and anticipates this figure exceeding 200 million nodes by 2020. 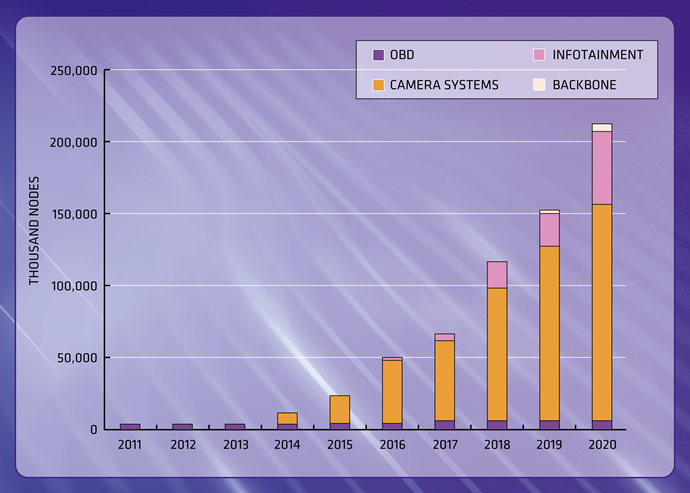 It forecasts that camera-based applications will account for around 75% of this figure - infotainment around 25%. On-Board Diagnostics (OBD) and the fundamental backbone will be present, but small. Audio Visual Bridging (AVB) enables stable, reliable, multi-media transmissions and refers to a set of technical standards being developed by the IEEE. The working group was renamed to the Time-Sensitive Networking Task Group in 2012 to reflect the expanded scope of its role. One of the reasons that Ethernet will dominate the AVB market is that the Ethernet architecture is extremely well understood and used in many high volume applications. However, the components are designed and qualified primarily for office or industrial applications - as they stand they are not suitable for automotive applications. The components need to be qualified to the relevant Automotive Electronics Council (AEC) standard - AEC-Q100. AEC-Q100 defines a substantial number of electrical, lifetime and reliability tests that are more stringent than those for a commercial or industrial IC. 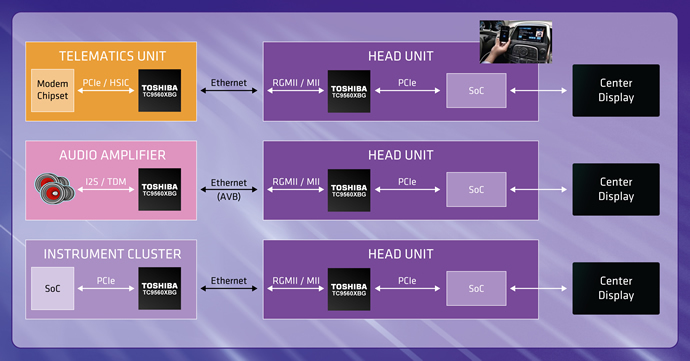 One of the latest devices to enter the world of AVB is an automotive grade Ethernet bridge solution for in-vehicle infotainment (IVI), telematics and other automotive applications from Toshiba Electronics Europe (TEE). The TC9560XBG supports IEEE 802.1AS and IEEE 802.1Qav. The device has been developed under the ISO/TS 16949 and APQP automotive design quality system and is in the process of being AEC-Q100 Grade 3 qualified. When connected to an application processor or other system-on-chip (SoC) host, the TC9560XBG allows the host device to deliver audio, video and other data through the automotive AVB network. A freely programmable, on-chip, ARM Cortex-M3 processor running at 187.5MHz performs system control and management and with the DMA controllers gives wide access to all system resources including the version 2.0 and 1.0 compliant PCIe bus (5GT/s or 2.5GT/s) for future extension and development. As Figure 2 (above) illustrates, the Ethernet bridge solution incorporates 512kB of SRAM, 6 channels of DMA, a full duplex UART and multiple control interfaces including USB HSIC (480Mbit/s), I2C, quad SPI, TDM/I2S and up to 36 GPIO pins. Power management is achieved via a low power mode with Wake-on-LAN (WoL) support, while security features include built-in SHA2 and eFUSE support. The TC9650XBG also offers two channels of CAN-FD support to connect into the automotive CAN network. The primary application of the TC9560XBG is to provide the interface between the Ethernet node and the chosen SoC. As such, the bridge is suitable for many different applications throughout the vehicle including telematics, audio subsystems, instrumentation in addition to within the head unit. In each case, the TC9560XBG is responsible for ensuring the correct implementation and operation of the IEEE AVB protocols within the system. The AVB bridge is a key part of TEE’s automotive product line-up, which also includes the TC358791XBG automotive companion chip that drives high resolution multi-media (audio, video) and camera connectivity for next generation infotainment applications in the connected car. Supporting the latest automotive Gigabit Ethernet AVB standard for a wide range of applications, such as front/rear/surround view cameras, digital audio and transferring high resolution video content to head unit and rear seat entertainment systems, the TC358791XBG can also interface with and support many automotive application processors, due to its USB 3.0 and MIPI CSI2 and DSI connectivity for both audio and video. TEE is further supporting the rapid development of AVB systems by providing two development systems including an evaluation board with full connectivity and a PCIe form factor board that can be plugged directly into a PC or used in a stand alone mode. Automotive Ethernet has reached a pivotal point in its development. As more chipsets are qualified to automotive grade and manufacturers support the design function with sophisticated tools, reference designs and development boards, then the pace of implementation and adoption will accelerate. Initially, the focus will be on infotainment and high bandwidth devices such as cameras, but the development of automotive Ethernet to 1GB speeds and, ultimately, 10GB will, by itself, bring further opportunities as the industry continues the drive towards the fully connected self-driving vehicles of the future.